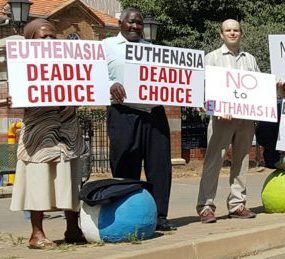 Ultimately the court ruled that faced with complex conflicting claims about the situation in foreign juristictions, it could not decide on the question of whether assisted suicide/euthanasia was being implemented well or not overeas - but left the matter in substantial doubt and affirmed that given our socio-economic context the probably of problems in South Africa was greater than overseas. The point is though that I think Margaret Dore's evidence at minimum neutralised the opposing argument and evidence - causing the court to refuse to admit the evidence of the assisted suicide lobby and categorise it as a mixture of facts, claims and hearsay which they could not sift through. At best it forms the basis for their finding that the risk of abuses & problems would be greater in South Africa and thus a hasty pro-euthanasia decision of the lower court could not be supported. . . . Please continue investing in the work of Margaret Dore, which is having an impact beyond your borders. It likely South Africa may have another court case next year or in future and the input of Margaret Dore may be helpful again.